Dr. Kent Cubbage provides advice to help students more successfully navigate college. It's an exciting time, but many incoming students find the ins and outs of college difficult to navigate. 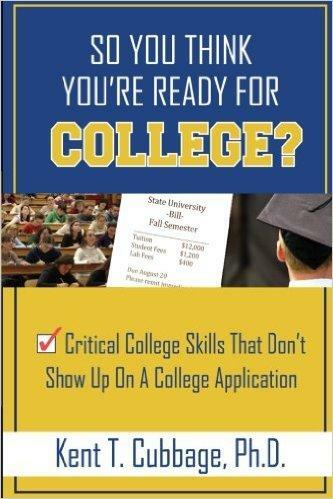 In his new book, So You Think You're Ready For COLLEGE? Critical College Skills That Don't Show Up On A College Application, Dr. Kent Cubbage provides tips and suggestions to students on everything from the best ways to communicate with professors to finding and taking advantage of the many services schools provide. Dr. Cubbage joins us this afternoon to discuss ways students can make the transition to college life easier, and help guarantee their success. According to the National Sexual Violence Resource Center, one in five women and one in 16 men are sexually assaulted while in college. These cases frequently make headlines, such as the recent case of Brock Turner at Stanford University, whose short sentence of six months for sexual assault sparked outrage. Last month, President Obama's oldest daughter, Malia, announced she plans to take a year off between graduating high school and starting her studies at Harvard. Acclaimed writer Delia Ephron has just released her new novel, Siracusa. Author Rick Yancey's bestselling book The Last Star was made into a motion picture starring Liev Schreiber and Chloe Grace Moretz which was released earlier this year. Barbara Gray is joined on the phone by Melissa Fay Greene, author of The Underdogs: Children, Dogs, and the Power of Unconditional Love, the account of one woman who, after being turned down for a service dog for being 'too disabled," took a nurse's advice and raised her own. Author C.W. Gortner has written a new biographical novel of one of the true Hollywood legends, and enigmas, Marlene Dietrich.